We all use our toilets several times a day. Having comfortable toilets that don’t leak is not just important; it’s a must if we want to continue using our toilets. Let’s face it, who would want to have their business leaking about on the bathroom floors? Not only is that unhygienic, it’s also a huge turn off factor and will probably have you dreading entering the toilet. Let’s not even start with the medical conditions you can end up with if you are unable to use the toilet properly throughout the day. One of the items that your toilet uses to prevent water from leaking as it passes from the toilet to drain pipe is none other than toilet wax ring. This article will aim to look at a five different toilet wax rings, the features that are included with each of them and will also help you opt for the best toilet wax rings, which will prove to be an overall good purchase. Best toilet ring seal also comes under this area. So if you’re waiting to find out which toilet wax ring you should get for your toilets, keep on reading. Each of the below five products have their strong points that we will try to give you an overall glimpse of. Do keep in mind, if you are looking to purchase for the first time, you may want to read up on different wax rings before finalizing which one works best for your toilet. If for any reason, one model doesn’t work out well the first time, you can always purchase another one and see how it goes. 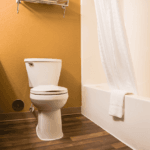 Speaking to a professional or simply other family and friends who have experience handling toilets and other household items can prove to be highly beneficial as well. 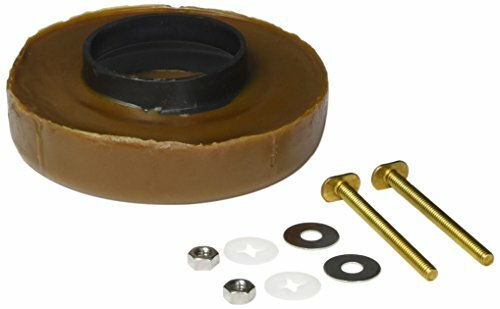 The fluidmaster7513 extra thick wax toilet bowl gasket with flange model seals and secures your toilet to the bathroom floor with sturdiness. The wax is extra thick and stronger than your average wax that comes with toilet wax rings. With a 40% extra-thick wax, it’s important to make sure the alignment of the toilet bowl with the floor is done carefully. This will save you from any wobbling or rocking back and forth of the toilet bowl in the future. 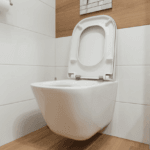 With the extra flange that comes with the model, you can fit your toilet bowl with the floor as well as below the floor waste lines, making it easier to install. The 7513 model also fits both 3” and 4” waste lines and a polyethylene flange is inclusive. You might as well give it a go and try installing on your own. The LASCO toilet bowl extra thick helps to seal your toilet with the floor while forming a watertight, gas and odor seal between the toilet bowl and the waste line. 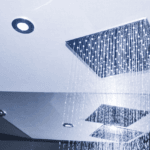 With easy installation options, you can give this installation a go on your own as well. The polyethylene (the most common form of plastic used in household items) sleeve helps to ensure a strong seal as well as the proper sitting of the gasket whether on a 3” or 4” floor opening. 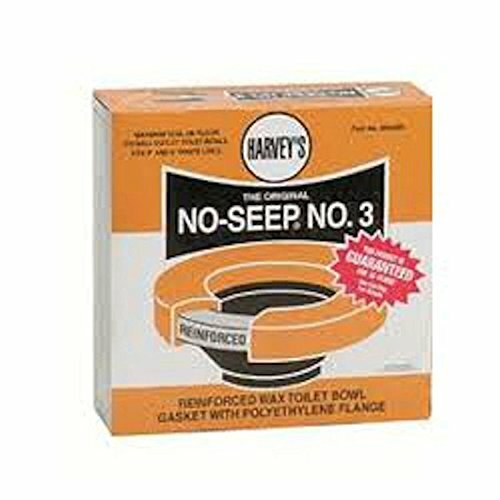 Due to the #35B extra thick toilet bowl wax gasket along with brass bolts, floor mount toilets can also be set up. Just for your general knowledge, brass bolts are preferred for use, as they tend to give off high thermal conductivity, meaning they have faster heating and ability to insert into plastic based parts. Plastic or soft material assemblies often rely on brass parts for easier setup. Costs are also lower for brass material compared to stainless steel, making it the preferred manufactured material. 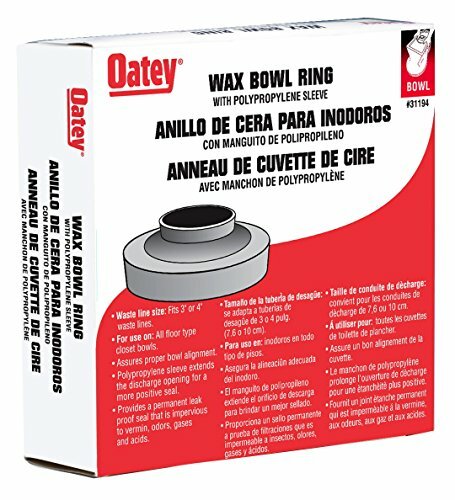 The Oatey 31194 model is a 100% pure petroleum wax gasket that comes with polyethylene sleeve. This model extends a discharge opening for added positive seal, guaranteeing a proper bowl position. Like the other models, this one fits both 3″ or 4″ waste lines. 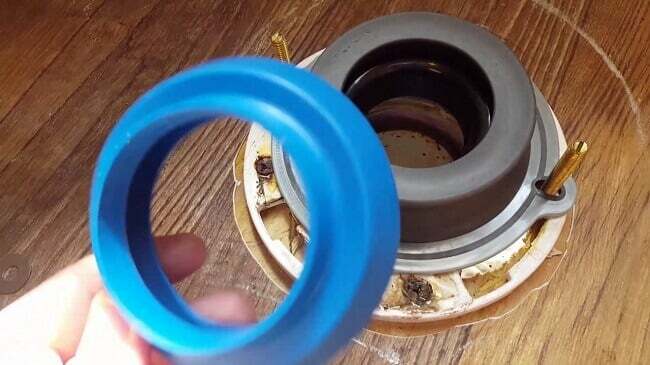 This petroleum wax gasket also makes it more resistant to things like vermin, acids and gases. A lot of this has to do with the sewers and the type of toilet being used to set up. To top it off, the model meets Military Spec. TT-P-1536A. 100% pure petroleum wax gasket intended for use in setting up any floor type closet bowl. Offers an enduring seal resistant to acids, vermin, gases and odors. The wax ring w/extra wax & bolts model comes with a sleeve and number 10 wax, which provides for a far stronger seal since this is the strongest wax level. This model can be used for all floor toilet bowls. Those with strong sewer smell insinuating from below the toilet bowl can consider using this model. Bolts are included along with an extender. The William H. Harvey 004305-24 model is meant for floor closet bowls only. It comes with polyurethane with flange and resilient springs with bowl movement. These will not decay or rot as the material used is intended to withstand pressure. The no-seep sleeve helps secure the sealing area and extends well into the waste line. If you do see any seeping, there might have been a mess up while setting it up. To top it off, the William H. Harvery 004305-24 holds up to 90 pounds psi under 85% compression. It is puncture resistant due to the urethane core reinforcement. Toilet wax ring helps prevent bad odor seeping up from the sewers. It also helps to align your toilet bowl with the floor below, on top of the toilet anchor flange. Hence it goes without say, it’s quite important to have a strong toilet wax ring. The following tells you a few things you should keep in mind and be on the look out for while buying toilet wax ring for your toilet. Keep in mind that the type of floor you have in your bathroom can play a role in determining whether your toilet wax ring gives an optimal performance or not. Replacing a floor such as a sheet vinyl floor with ceramic tile (which is thicker in form), can actually help to form a gap between the toilet and toilet anchor flange. Simply add a flange spacer to cover the gap. This makes for a stronger toilet arrangement and durability is also strengthened. One of the most important components to look out for when purchasing toilet wax ring is the wax strength. The strength of the wax helps make the wax ring foolproof. The strength of the wax also resists bacteria and mold and helps the model retain its sealing ability even after years of usage. Not to mention, the ring itself is made from molded wax, shaped in the form of a loop around a short plastic tube, so it’s essential to use good wax to make the product. If your toilet seems to wobble back and forth, even slightly, you may have a broken toilet anchor flange. You may need to use a flange repair kit to fix this wobble. 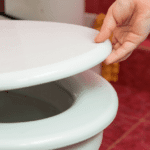 One of the most important things to ensure when setting up or resetting a toilet bowl is the flange height. With your toiler removed, you should be able to note the toilet flange and measure the height of the flange above the floor. 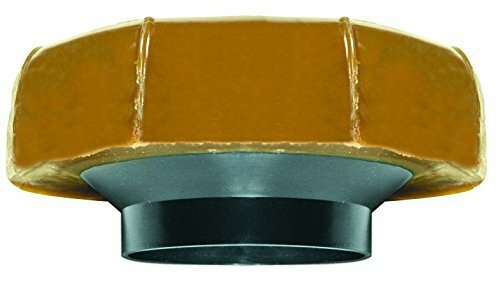 Optimum flange height that you should keep in mind is around ¼ an inch above the floor. 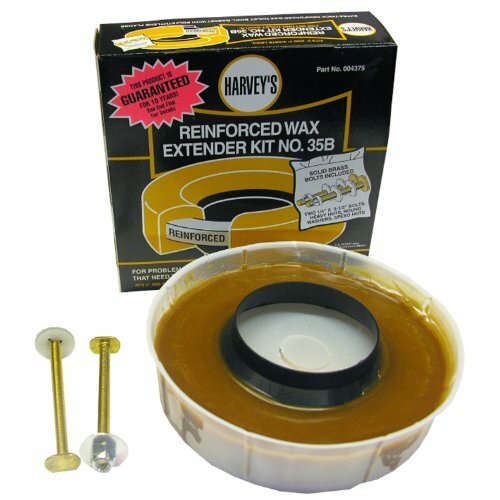 This allows room for pretty much any time of wax to be used while ensuring a great seal. Make sure to check the condition of the mounting bolts that help attach your toilet to the floor below. If the bolts look corroded, you will need to purchase a can of penetrating oil to help loosen the bolts. Even if the bolts don’t appear to be corroded, sometimes it’s best to replace the bolts just as a cautionary measure. Some wax rings come with a kit that includes new mounting bolts. Also, if you remove the toilet due to leaks or water damage in the floor, make sure to inspect the damage before replacing anything. Water can cause enough damage to affect the strength of bolts attaching the toilet anchor flange with the floor. You may need to cut away certainly damaged subfloors instead of removing parts as a whole. You may think it’s only the wax ring that offers protection against leaks but other factors can help secure your toilet with the ground. Something like caulking around the base of the toilet once you finish aligning the toilet bowl over the flange can do wonders. Make sure to cut off any part of the toilet shims that twig out and seal around the base linings of the toilet. This will provide greater protection against the toilet having any kind of wobbly movement in the future. 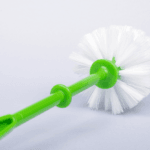 The icing on top is, it will be much easier to clean since you will no longer get a layer of dirt and dust under the toilet where it’s difficult to reach. To conclude, keep in mind that even though a toilet can last you a good 20 to 30 years, the toilet wax ring needs to be changed a few times in between alongside your toilet ring seal. This will help to increase the longevity of your toilet as well as keep the toilet smelling better. Besides, who wants a smelly toilet that leaks and lasts for two to three decades? It’s better to have a good smelling toilet lasting 10 years, than a smelly one lasting 20 to 30 years, what say? Getting rid of unwanted leaks and securing your toilet bowl to the floor will, of course, do volumes in making sure your bathroom doesn’t stink of unwanted odors. Keep the overall goodness of your bathroom in mind while looking into the settings of each component within your bathroom. Not only will your guests appreciate a hygienic bathroom with a good smelling toilet, but you will also find entering and using your bathroom a more fulfilling experience as well. Nothing beats that.